As part of the your dinner sleigh ride experience we prove transportation to and from the town of Telluride. Please visit our website for more information. Van picks-up and drops off at the San Miguel County Court house located on the Main Street at 305 W Colorado Ave, Telluride, CO 81435. 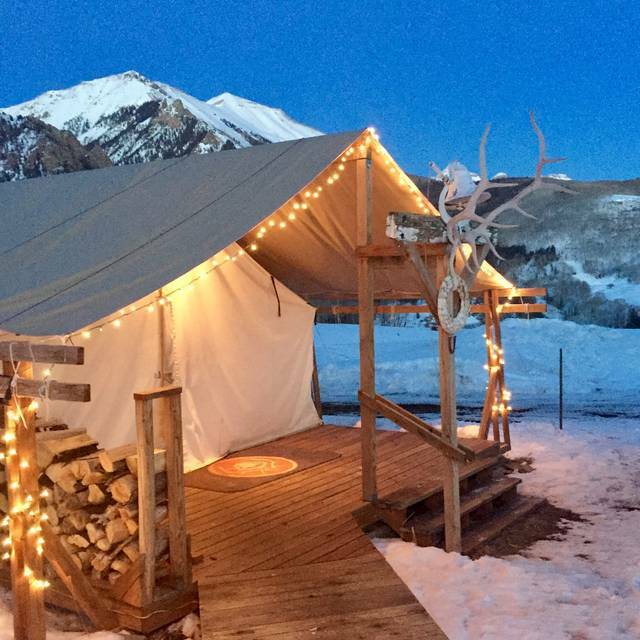 If you are looking for the a private and unique dining experience for you next special occasion look no further than Telluride Sleighs and Wagons. Set on a private historical sheep ranch 20 minutes from Telluride with breath taking views of the San Juan mountains its the perfect setting for any occasion. Telluride Sleighs and Wagons is available for catering for groups of 30 or less. Please contact telluridesleighs@gmail.com for more information. We are excited to continue our partnership with Horse Play LLC to provide horse-drawn sleigh and wagon rides. 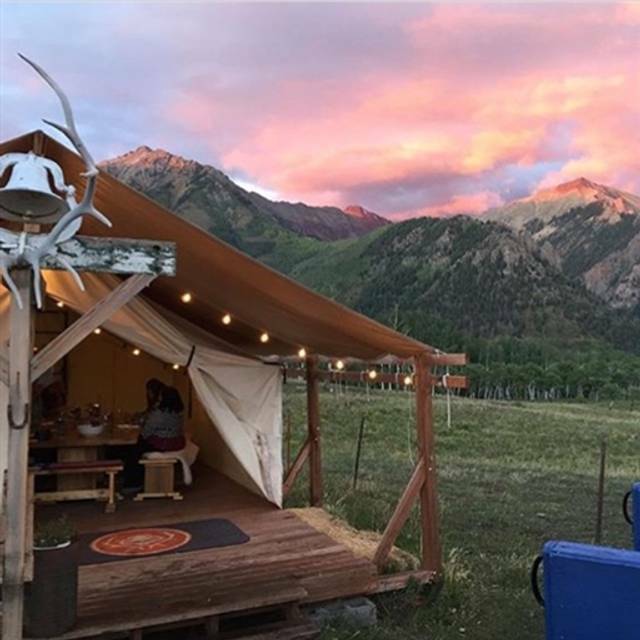 Located on the historic Aldasoro Sheep Ranch on Last Dollar Road, guests enjoy stunning views, exceptional food in our canvas sheep camp tents after a horse-drawn sleigh or wagon ride. The tent is heated by a wood burning stove and guest dine together family style at our custom build farm table. You'll hear stories about the Aldasoro familys five generations of history in the Telluride area and eat food influenced from the Basque country where the family is from. Price includes drinks, but feel free to bring your own libations! Please dress warm! There are extended periods of time spend outside in the open air. Kids are encouraged to wear snow gear, and adults are encouraged to layer. Please wear sturdy, warm shoes as you will be walking in snow. Wonderful experience. Food was delicious. So unique. It was over too soon! Beautiful snowy winter sleigh ride with fun couples at 6:30. Food was very good and plentiful, tent setting was romantic and warm. Wonderful host Josie. Highly recommend an evening with Telluride Sleighs and Wagons! Was a birthday dinner with my wife. Both the chef & sleigh driver are friendly & accommodating. Very professional program from start to finish. Special evening with special folks! Phenomenal food and great atmosphere! Highly recommend! Absolutely fantastic evening for our Party of 10. Food was so yummy & the owner very sweet. Absolutely stupendous dining experience. The team at Sleighs and Wagons were so welcoming and fun and the food was delicious. And most importantly the sleigh ride was unforgettable! The horses, the sunset, the stars- everything was gorgeous. Thank you! A unique experience and highly recommended!! I would return. Food was very good. Ambience is excellent and the history and story behind it is very nice. The van ride is long and the sleigh ride is short, though. Rest is excellent and the beef and lamb were excellent. Our second year on the sleigh ride. So much fun and wine, apps, dinner and dessert are wonderful. Highly recommend! The mountains are spectacular and recommend the 4:30 ride. You experience both daylight and the stars on the ride back. The evening was absolutely perfect. The food was top notch and the service was awesome! Super authentic evening! I would highly recommend this to anyone looking for an experience with an amazing meal! delicious. We had a large group with 5 kids 3-14 and 7 adults and they had good kids meal choices, hot chocolate, giant smores, and lovely wine to go with dinner. Our most memorable night in Telluride! This an amazing memory-experience. We took our family of 11 people- 6 adults and 5 grandkids ages 7 yrs.-5 months. Beautiful sleigh ride pulled by two huge, gentle horses. Food was fantastic. All the staff was SO kind. If you are in Telluride, don’t miss this experience. It’s expensive but worth eating in for a few nights to save the money for it! Ashley the owner was a phenomenal host. She drives the group up to her family’s land above Telluride Airport. From there we took an amazing sleigh ride with 2 beautiful draft horses - Bambi and Pearl. The sky is amazing as we were away from light pollution. We saw the Milky Way, constellations and Mars. Once we arrived there was a cozy tent for us to eat in. The food was fabulous. I ate so much of the curried butternut squash bisque I could barely eat my entree. Wine was plentiful and a wonderful time was had by all in my group. We will come back and do this again! Amazing experience for our family! We would do it again in a heartbeat! My children and all of my grandchildren had an amazing experience with their grandmother! From 2yrs-11 had so much fun The food was great; almost too much to eat. The staff were so friendly and the environment was magical. Thank you Ashley and Justin! My children, ages 11-17, and I had the most fabulous experience. The highlight to our vacation in Telluride. We highly recommend! All staff was punctual and so incredibly friendly. Absolutely wonderful authentic horse-drawn sleigh ride that includes scenic mountain views high above Telluride. Ashley is a delightful hostess and creative entrepreneur who represents the fifth generation family of Aldasoro's who own this ranch in this venture. The dining experience was incredible from the first cocktail, through appetizers, soup, entree, and dessert. Totally loved by every member of our party! Truly magnificent. Perfect for special occasions! Overall the experience was wonderful. Food and service was great. My only criticism was that the dinner portion felt rushed. I would have enjoyed a more leisurely experience. If the evening was an hour longer that would accommodate all the courses as well as wonderful conversation. I was so impressed by everything overall! What a unique dinner in a town filled with unique and wonderful restaurants, this dining experience is not to be missed! I brought a special bottle of wine along, and was glad that I did, but the included options were good as well. Both the lamb shank and the buffalo were fantastic! Make sure to dress for the weather, they also provide blankets for the ride. Ashley, Justin, Graham and the whole gang made sure we had a memorable evening! The sleigh ride and dinner were awesome! Looking forward to joining them again the next time we’re in Telluride! It was an amazing evening we won’t soon forget!!! The staff was exceptional all the way through from the start to the finish. We star gazed with excitement on the horse drawn carriage. The interior was so charming with a roaring wood burning stove. We started with wine and a cheese plate. Choice of wine was very good, but the cheese needed to be a better quality and selection. The squash soup had a wonderful taste, but needed to be thinner- too chunky. Main course was a pan seared white fish on a bed of succotash which was very tasty. Then came a pulled pork popover with savory fruit. Tasty but the popover presentation was too large and doughy. Since it was a birthday, we were surprised with a chocolate cake topped with a dark chocolate glaze and caramelized maple bacon. Interesting taste. An after dinner drink scotch/ liquor with the desert would of been perfect to complete the meal. Maybe they'll add it or maybe you can bring our own. Reservations were made on opentable which needs some tweaking. We never knew how much it cost until 2 weeks after we had signed up, we got an email confirmation. Overall it was a wonderful venue. Food quality and presentation needs some improvement for the $160 per person fee. At least I think that's what it cost. I haven't checked my cc statement yet. We had a wonderful experience with Telluride Sleighs and Wagons. Gorgeous views and a gourmet dinner! One of my favorite parts of our trip to Telluride! We were looking for a fun activity and dining experience and we got both! It was the most amazing experience ever! You eat dinner with a group and meet lots of interesting people! We met some life long friends! The staff is so fun and the food is out of this world! Ask about the gorgeous dining table! The best part was the atmosphere and sunset setting! Stroll along on a horse and buggy ride as you pass Elk along the way. Sip hot cocoa on the way home and listen to the stories of the locals. You will feel like you went away in time. These are the friendliest people on earth! Took our family to dinner three kids (3, 6 and 8) and had a wonderful time. Very intimate and cozy atmosphere. The staff is friendly and helpful. Views are amazing and the food was delicious. Fabulous experience, beautiful dinner with delicious food. Fun wagon ride - and the full moon and stars were spectacular. My only negative comment was the set dinner price. There was generous wine and alcoholic drink options and we didn't drink, yet paid the same price. Loved loved loved this special adventure ! Incredible, unique experience! Definitely a memorable experience! I have enjoyed each and every sleigh ride that I have attended. I meet new people, enjoy old friends and cherish my time with family members. The food is wonderful and the staff is so nice and helpful. This was one for the books! What a special night! There were seven in our group, including three teenagers, and we will remember our night at Telluride Sleighs forever! It’s an expensive evening but priceless memories. Staff was great and food was amazing! We also learned a lot about the rich history in Telluride. And saw a pack of elk on the ride back to town! One of the highlights of our family week in telluride. This was our second time dining here. We will be back for many more times. Highly recommend to anyone looking for a nice romantic night. You won’t regret it! Telluride Sleighs and Wagons was a wonderful experience. Situated high up in the mountains, this experience begins to feel rustic but with all the charm one would hope from enjoying a delicious meal. The hosts were wonderful and considerate of everyone's needs. After dinner before our ride back to town, the stars were endless! So great! Would have been better if it had been daylight to enjoy the scenery. We booked a 4:30 but not enough people so we went on the 6:30. Our tour was after dark and also would suggest to the owner to provide a flash light for getting from the van to the sleigh. Difficult seeing in the dark with ice and snow covered ground. Food was average not superb. Ambiance, lighting, warmth very nice. Food service excellent. Never know until you try. I would definitely recommend the 4:30 ride especially Winter Months. This Sleigh Ride was magical! The Belgium Horses with jingle bells, were guided by Noah, our Sleigh driver, were pulling the sleigh through the snow, with a million stars in the majestic night sky - oh what a treasured cherish memory was created that night for our group of 7. Blankets were provided but be sure to dress very warmly as it was very chilly. Arriving at the dinner site, we were treated to a welcoming outside fire in a huge kettle-like fire pit. The tent was glowing from the beautiful lights and wood burning/heat producing stove. The table was set in a winter-like theme - all very beautiful. 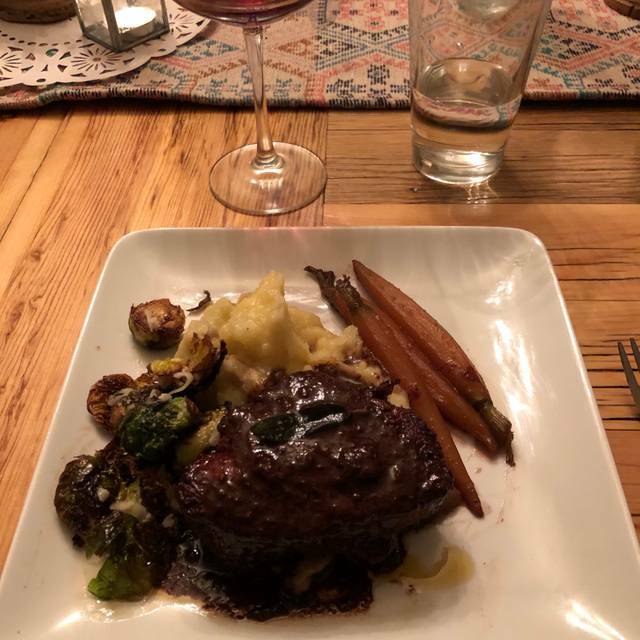 The wine and food were delicious and Ashley who is fifth generation Telluride, delighted us with stories of her great grandparents which came from Spain and settled in Telluride. Very interesting and entertaining! Highly recommend for special occasions and groups. They take up to 14 guests but book early. We booked weeks in advance. P.S. There is one outdoor heated portable potty - but no running water. Wanted to include more pictures but looks like the pics won't load. We booked this restaurant because it was a unique experience to try while on vacation. It began and ended with a horse-drawn sleigh ride. We loved the atmosphere of the tented dining room and the friendliness of the other guests and all of the hosts. Cocktail offerings were generous. We were offered one of three entrees and chose the steak. I noted on the reservation that we wanted the meat cooked to medium, but they came out rare and medium rare. When asked, the chef did take my boyfriend's back and cooked it longer. We enjoyed hearing about the history of the ranch and how Telluride Sleighs and Wagons came to be. We knew going in that the cost per person was going to be very expensive but were surprised that an additional 20% tip was expected. Because of the cost, we would hesitate to recommend to others.